Lake Eucumbene continues to rise. We predicted some great fishing before last seasons sensational spring and early summer. The potential for the lake to fish as well if not better than last season is very real. We are predicting that the fishing will, if the lake gets to 27% or greater be a real eye opener. Watch this space. Lake Eucumbene:- Fly reports have been spasmodic. Fish quality has been excellent in the rainbows but some of the browns that have returned from spawning are a little poor. Anglers reach locals have reported a few fish though they have been working for them. The dam wall can fish very well at this time of year on rainbows and would be a good option if there is a strong West/Sou West wind blowing. Lee Payne had a good session on the lake recently spinning with Jackals. 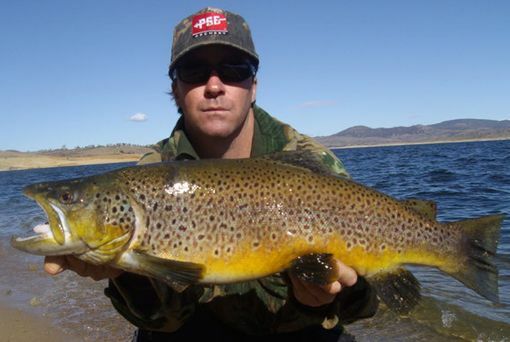 He had nine good browns follow his lure to his feet but only managed to sink the hooks into one. It was a very good fish he landed weighing 3kg.